You Never Know What I’m Going to Make! This is easily one of the most time and effort intensive, technique loaded card I’ve made in a very long time. Hope you think it was worth it! The OCC challenge this week is a supply challenge: 1, 2, 3, 4! USE 1 patterned paper, 2 layers, 3 stamps and 4 embellishments. I used the focal image and my sentiment as my 2 layers (I thought at the time that mats didn’t count and the card base doesn’t count). My 3 stamps are the sentiment, the girl and the damask stamp for the wallpaper background. I used the flower as one embellishment, the center as another (I’m not counting them separately because I was trying to mimic the look of a vintage button which had the pearl look already on it.) and the ribbon and white button each as one. It took some brain power but it was really fun so I hope you will play with us at the OCC blog! I rarely describe my thought process while making a card and this one required a LOT of thought so it is perfect. I started with the image. After choosing it, I immediately went on a hunt for some patterned paper to go with it because I with so many colours needed, I wanted all my markers to coordinate with the paper and some to match the paper. I choose the cupcake paper from Basic Grey’s Nook and Pantry pack. I stamped the image twice, coloured and cut out my images. I meant to take a picture and forgot but when doing paper tole, you don’t always have to use the entire bottom layer if it doesn’t make sense. Behind this gal is the table only except where she overlaps the table, I left her torso in. But below the table and for her head, I cut away all the excess. I only left her torso in because her arms overlap things on the table and from the side it would look weird if there was nothing behind her, like a partial jar of sugar! But the rest of the image looks more realistic because there is nothing behind her. I colour only the edges of the image underneath to save time and ink. Normally, I would just airbrush in an indistinct background and shadow but I ran out of ink so I decided to go all techniquey! I drew in a horizon line and flooring lines and masked off the wallpaper area. I sponged in the planks in one at a time hoping I would get variegation in colour by mixing two inks; since the ink blend would never be the same, I figured I’d get differently shaded planks. Unfortunately, I should have used traditional inks, not Distress inks because they blended so well I neither have distinct colours nor darker edges and lighter centers for each plank. Then I used the faux batik technique (SCS) for the wallpaper and sponged in my wall colour. I’ll let you look that up rather than describing it as this post is already way too long but use tinted embossing ink if you have it, just saying ‘cuz this gal is covering up some weirdly patterned wall paper! This time Distress ink was perfect as it gave me a smooth finish. I was so proud that the background techniques worked so well together; I agonized over which to do first in case I messed one up! Now I started thinking about my card layout and chose this sketch from the ones I save on my iPhone. But when I layered the focal image over the cupcake paper, it overwhelmed the delicacy of the image even when matted. Back to the drawing board. Remember, I have to keep in mind the 1, 2, 3, 4 challenge at the same time! Couldn’t decide what to do and briefly started working on a recipe file for my kitchen, covering the front with another paper from the same pack. But the front was too small for one sheet of DP and I thought now the cupcake paper would work because it would cover the excess areas on the edges and be far enough away to not overwhelm. But I just couldn’t mess up the OCC challenge with 2 sheets of DP! So I settled on this THIRD piece of DP and started back on a card. I made my favourite type of home made flower which turned out how I wanted it to and I was happy again. Here I describe how I made it: Scalloped Scrunch Flower. This time I used the 4 smallest shapes. I found a button to match the center and coloured the pearls with my Copic. I already had Baked Love in mind for a sentiment, I just chose one that worked with my image and space I had left. I always leave the journaling until the last minute when I scrap too and have to find space! Whew! Finally, all requirements were fulfilled! Total? About 5 hours! Yep, crazy right? A couple hours of that was figuring what to do! Click on sketch for link to Unscripted Sketches. I hope you will play with us at the OCC this week. We love having lots of players and don’t forget! We now award prizes to the top 4 cards choosing a Top Talent and a Talented Trio! And you just HAVE to visit the blog to see all the talented designers in our awesome team!!! Click on their blog names to visit their sites and leave ‘em some love! Ink: Victorian Velvet (flower), Scattered Straw, Antique Linen, Frayed Burlap, Vintage Photo, Embossing Distress Inks, chocolate chip-SU! All I can say is wow… I don't know that I would have hung in there for five hours!! It's gorgeous, though – I love all the techniques you used and you have lots of great tips – thanks for sharing the whole process and the beautiful result! 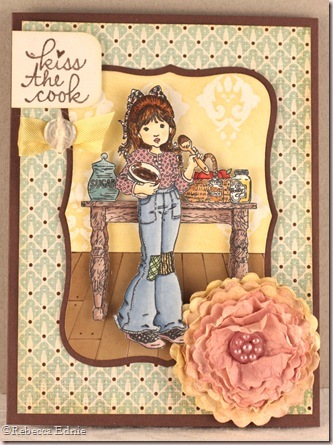 Very pretty, I love playing with paper tole and paper piecing, it reminds me of making paper dolls! Beautiful card, love all the detail you put into it! I too had trouble deciding if mats counted as layers or not when creating my card, oh well, I love the way they both turned out! oh my goodness what a lot of work you went to for this card! I really love the way you did the floor. Your coloring is wonderful and I love the pearl touches. Great job! Rebecca, I can't believe you drew in those wood planks! The perspective is perfect, and I do actually see some of the color variation. The big flower is so gorgeous! Hope you have a great weekend. This is SO GORGEOUS! The girl image looks like a professional die cut…WOW! And the flower is beautiful! This was a challenge, and you ROCKED IT!!!! Wow, Rebecca, this creation is an inspiration! Your combination of stamps look fabulous, and your coloring is always gorgeous. Beautiful work! WOW, I'd say it's DEFINATELY WORTH IT! =) Love the wood floor and wallpaper! Cute scene and lovely papers. I LIKEY!